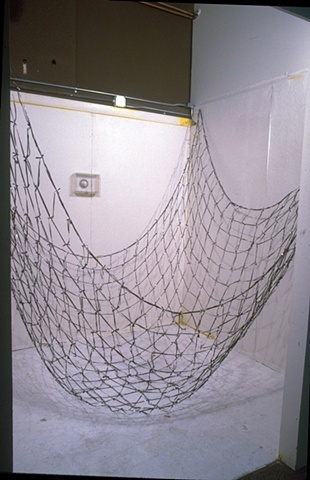 "Net of Silence" is part of an ongoing investigation using audio tape as a sculptural medium. On a formal level, the audio tape is a fragile, light, linear filament, capable of being woven, twisted and tied. On a conceptual level, audio tape is a container: it is used extensively to document and entertain. It can store sound or silence: audio taped interviews have convicted criminals, and audio silence has impeached a President of the United States of America. The net is totally flexible and appears to be strong and functional, yet is weak and could not support any weight or strain. It contains 6 hours of silence. Consequently it is an object that hovers between many contradictions.